Today sees the launch of the QS Asia University Rankings 2019, and to celebrate, we thought we’d take a look at the incredible things the region has to offer for study abroad students. From world-leading universities and growing economies to mouth-watering cuisines and exciting student cities, there’s plenty to welcome you if you decide to study in Asia. The region offers a distinctive cultural experience, with underlying tropes and traditions taking on new life and interpretations within each nation’s unique historic and contemporary contexts. From celebrating Chinese New Year in Singapore to Hindu Thaipusam in Malaysia, the following is our pick of 10 must-see cultural festivals in Asia roughly organized chronologically – leave a comment below to add your own favorites! The annual Harbin International Ice and Snow Sculpture Festival is perhaps the largest ice and snow festival in the world. Taking place in the winter months, this unique festival showcases beautiful ice sculpture artworks, ranging from small mythical creatures and beautifully lit ice lanterns to awe-inspiring 250-feet monuments in an amazing display of craftsmanship and light. 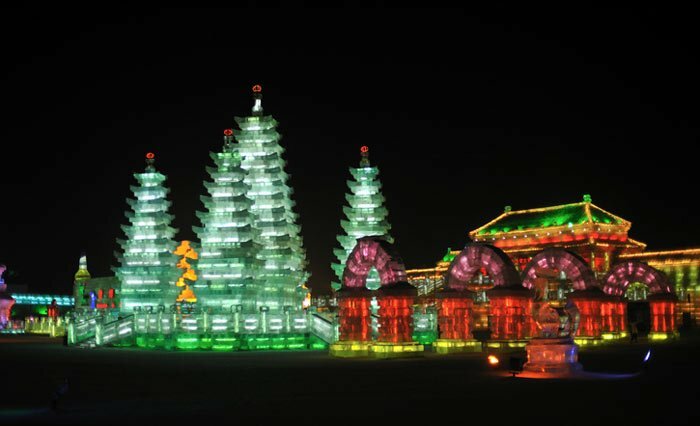 The first ice lanterns were a winter-time tradition in northeast China, hand-made by local peasants and fishermen by pouring water into a bucket, letting it freeze outside then gently pulling out the resulting bucket-shaped ice from its container. Then, they would chisel a hole in the top, creating a hollow vessel in which a candle was then placed, creating a windproof lantern to use while out on the lake. When to go: The festival is officially held from January 5 to February 5, but exhibits may open earlier and stay open longer. The winter travel season begins in mid-November, but exhibits first start forming in mid-December. Top tip: We’re betting you’ll want to take lots of pictures when you get to the festival, but keep in mind that the average January low in Harbin is 13°C (9°F), which can sap battery life faster than usual. Bring extra batteries, or try warming your battery now and then to keep it going. Where to study: Chinese universities dominate the QS Asia University Rankings, led by Tsinghua University at joint third. A further eight institutions join the top 50, while a total of 113 Chinese institutions feature in the top 500. China is also featured in the QS BRICS University Rankings, taking seven of the top 10 places. Attracting over one million devotees and tens of thousands of tourists, Malaysia’s celebration of the Hindu festival Thaipusam is an eight-hour procession that starts at the Sri Mahamariamman Temple in Kuala Lumpur and ends after a flight of 272 steps to the stunning temple at Batu Caves just outside Kuala Lumpur. Thaipusam is usually celebrated by the Tamil community on the full moon in the Tamil month of Thai (January/February) and in communities where there is a significant Tamil presence. What is perhaps unique about Malaysia’s celebration is the rare scene of people from different ethnic groups and faiths also bearing “kavadi” alongside the Hindu devotees. Kavadi is a physical burden through which devotees implore for help from the God Murugan in order to avert some great misfortune. While the simplest kavadi might entail simply carrying a pot of milk on their heads or carrying a semicircular decorated canopy supported by a wooden rod on their shoulders, some devotees also engage in mortification of the flesh where the skin, tongue or cheeks of devotees are pieced with vel skewers – definitely not a sight for the squeamish! When to go: Dates are decided by the Tamil calendar, and are projected to be January 21 in 2019 and February 8 in 2020. 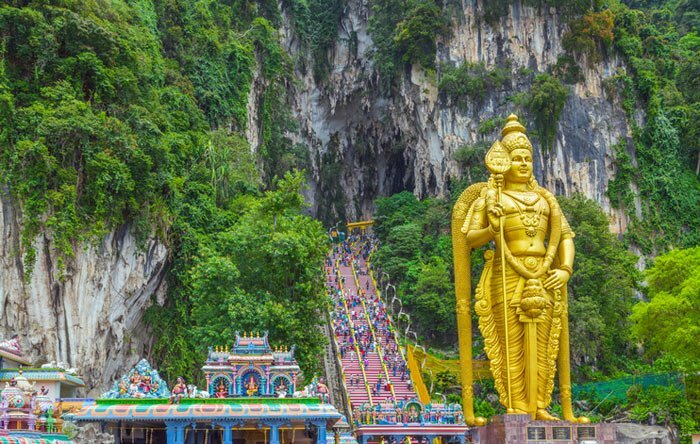 Don’t miss: While watching the devotees might take up most of your time, make sure to also visit some of the impressive limestone caves in the Batu area. At the top of the 272-step staircase is Temple Cave, with architectural columns made of stalactites and stalagmites. Nearby are three indoor galleries: the Valluvar Kottam, a reptile gallery and an art gallery. Where to study: Malaysia has a strong showing in the QS Asia University Rankings, with 26 of its institutions making the Asian top 500. Malaysia’s highest ranking entry is Universiti Malaya, ranked joint 19th. Chinese New Year is among festivals in Asia celebrated across the region, but our pick is Singapore, which throws the best celebrations outside of China with a three-day party. Also known as Lunar New Year due to the lunisolar Chinese calendar, Chinese New Year is an important traditional Chinese holiday and the longest festival in the Chinese calendar (it runs from Chinese New Year’s Eve up to the Lantern Festival on the 15th day of the first month). Singapore’s three-day party is one of the most anticipated events in the country, featuring dragon parades, fireworks, colorfully-decorated streets with intricate lanterns, nightly staged shows at Kreta Ayer Square and a lion dance competition, all of which are punctuated with the multicultural sounds of music from around the world. Of note are the street parties, the Festive Street Bazaar, the annual Chinga street parade with colorful floats, and the Fire Party with cultural performances and a traveling dance competition. When to go: The event usually falls in January or February and is projected to be on February 5 in 2019. Did you know…? Traditionally in China, red envelopes or packets called hongbao in Madarin, lai sze in Cantonese, ang pow in Hokkien and fung bao in Hakka are passed out during the celebrations, usually from married couples to unmarried people. The packets will usually contain money, given in even numbers and in ‘lucky’ denominations such as eight or six. Where to study: The National University of Singapore (NUS) tops this year’s QS Asia University Rankings, while Nanyang Technological University (NTU) holds strong in joint third place. The Holi Festival of Colors (also called the Festival of Love) is an ancient Hindu religious festival usually held in March. 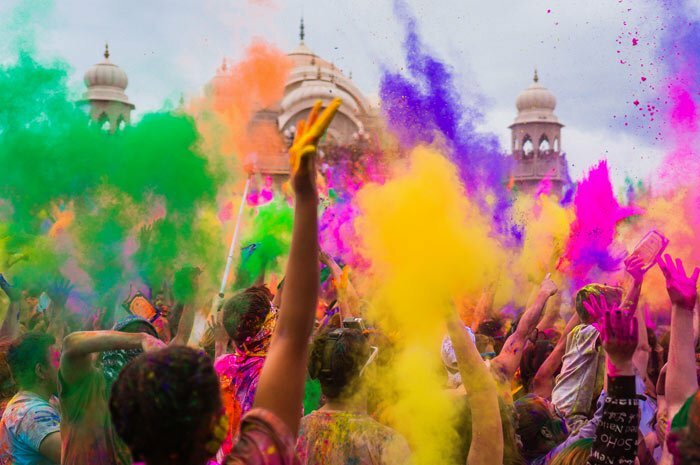 Celebrated by all Hindus and particularly in India, Nepal and Pakistan, Holi has grown in popularity with non-Hindus across South Asia and all over the world wherever there is a large Hindu community. Holi (known as Dhuli in Hindi) is one of the most important festivals in the Hindu calendar and is a fivefold celebration: the beginning of spring, the beginning of the Hindu new year, a time for renewing old relationships and ending conflicts in current relationships, love (signified by Radha’s love for Krishna, a Hindu deity) and the triumph of good over evil, (signified by the religious legend of demoness Holika’s death). Celebrations begin with the lighting of bonfires the night before Holi, in a ceremony known as Holika Dahan (burning of Holika). This is accompanied by singing, dancing and general merriment to the sound of dholak drums. The next day, Holi, brings laughing and dancing crowds throwing colored powder (abiror gulal) and water at strangers, friends and foes in a celebration of joy and goodwill. After a day of play with colors, families then take the time to visit each other’s houses, exchanging sweets and Holi delicacies. When to go: Dates are projected to be March 21 in 2019 and March 10 in 2020. Did you know…? The tradition of consuming bhang during Holi celebrations is particularly common in Northern India and standard practice across India. While an integral part of tradition and custom in India, bhang is an intoxicating drink made from the female cannabis plant. Where to study: Of its 75 institutions in this year’s QS Asia University Rankings, India has four in the top 50, including its top-ranked Indian Institute of Technology Bombay (IITB) in 33rd place. Don’t forget India is also featured in the QS BRICS University Rankings – the most recent edition was launched on the October 17 this year. There are lots of different lantern festivals in Asia, but perhaps the most stunning and most renowned is the Taiwan Lantern Festival held in the Pingxi District. Hosted by the Tourism Bureau of the Ministry of Transport and Communications to celebrate the wider Lantern Festival also observed by the Chinese and Vietnamese, this cultural festival involves many activities all throughout Taiwan. In the Yangshui District, for example, Tainan Yanshui Fireworks Display (meaning beehive of fireworks) at the Wumiao Temple is one of the most important, originally signifying the warding off of evil and disease. Over in the mountainous Pingxi District, the sky lanterns were originally released to let others know that the town was safe. The two events are known together as the “Fireworks in the South, Sky Lanterns in the North”. While the event is celebrated with lantern making, lantern riddle games and displays of glittering decorative lanterns, the most magical, romantic and striking event happens when the lanterns are adorned with the wishes and dreams of each owner and then released simultaneously along with thousands of others. When to go: Held on the first full-moon night of the lunar year, which usually falls in February or March. In 2019, the Taiwan Lantern Festival will be held between February 19 and March 2. Did you know…? 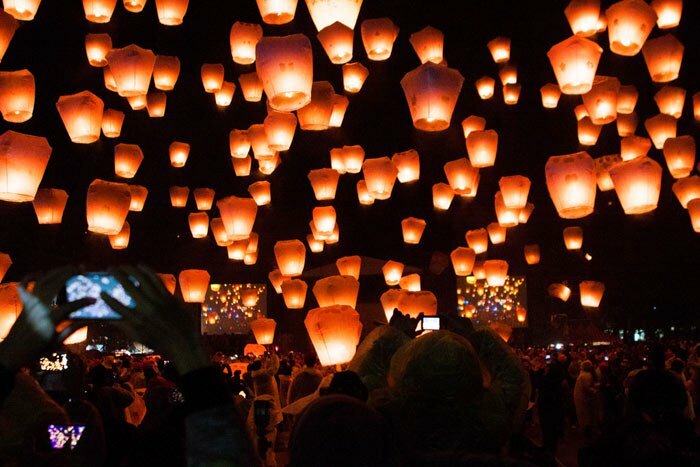 This magical experience influenced the imagery in Disney’s Tangled and formed the basis of the storyline, where the Lost Princess Rapunzel’s birthday would be honored each year with the release of thousands of sky lanterns. Where to study: Taiwan provides plenty of choice for students with 36 institutions in the QS Asia University Rankings. Its top-ranked National Taiwan University (NTU) is ranked an impressive 22nd place, with 10 other Taiwanese institutions in the top 100. Sawatdee Pee Mai! The Songkran Festival celebrates New Year’s Day in Thailand and also coincides with the New Year of many calendars of countries in South and Southeast Asia. 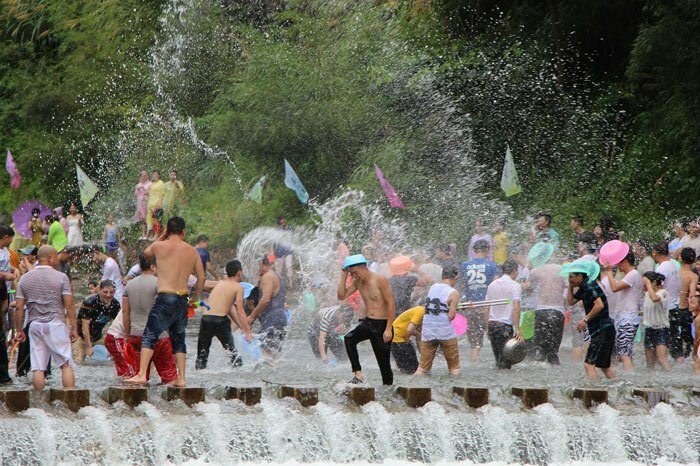 As such, it might seem at times that the whole of Asia has descended on the streets of Thailand when Songkran – the world’s biggest water fight – begins in April. Perhaps Thailand’s most energetic and well-known cultural festival, Songkran brings reveling crowds to the main streets, rubbing brightly colored chalk or talc on each other and throwing water. Armed with buckets, bowls, water guns and even hoses, the young and old take part in this friendly war of waters, indiscriminately ‘blessing’ all passers-by in the warmest month of the year. The throwing of water is symbolic of the spring-cleaning aspect of Songkran and is also seen as a way of paying respect to others, while the chalk was traditionally used by monks to mark blessings. While it’s not clear exactly how Songkran began, the festival has roots in Buddhism, with many Thais still honoring the festival’s origins. Locals celebrate the New Year by returning home to their families, spring-cleaning their houses, sprinkling water from silver bowls onto the hands of elders and monks as a sign of respect (known as Rod Nahm Dum Hua), paying homage to Buddha and taking food and bags of sand to monasteries. When to go: Originally dictated by the lunar calendar, Songkran was later fixed to take place between the 13th and 15th of April each year to reflect the week-long festival’s popularity with tourists. Chang Mai, the 700-year-old city in north Thailand, is the center of the Songkran festival. Top tip: Wear appropriate footwear such as rubber-soled shoes or sandals – the flour/water combination can get extremely slippery! While we’re on the subject of clothing, there’s no dress code to the event – anything you don’t mind getting wet is fine – but do remember that some colors become see-through when wet. Where to study: Thailand’s highest ranking institution Chulalongkorn University takes an impressive 44th place in the QS Asia University Rankings, and the country commands a total of 19 places in the top 500, including six in the top 150. 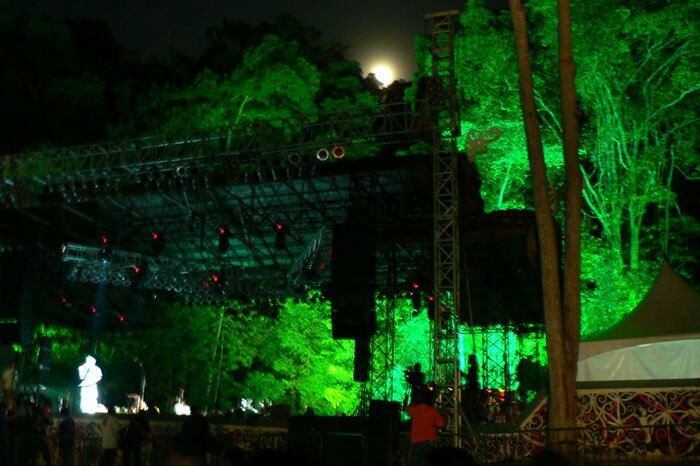 The Rainforest World Music Festival (RWMF) is a unique festival held in the Malaysian island of Borneo to celebrate music, nature and culture. While the main event brings renowned world musicians from all over the world to perform alongside indigenous musicians from Borneo, the three-day festival also includes a packed schedule of informative workshops, ethno-musical lectures, intimate jamming sessions and mini concerts. The Rainforest World Music Festival takes place at the Sarawak Cultural Village in Kuching and is one of the largest musical events in Malaysia. The main stage is situated in the midst of lush greenery in the heart of the Borneo Jungle and is accompanied by food and drink stalls offering local and regional Malaysian and Asian cuisine, an arts and crafts area to satisfy your sure-to-be-tingling creative senses and plenty of souvenirs and festival memorabilia to take home. Visitors can enjoy the relaxed atmosphere as they spend their days learning about music, and their nights enjoying that music under a rainforest canopy. Top tip: Arrive early to check out the cultural displays, demonstrations and workshops that are included in the entrance price. When it comes time for the evening performances, it might be worth bringing your own mat to sit on the grass, as seating tends to fill up pretty quickly. 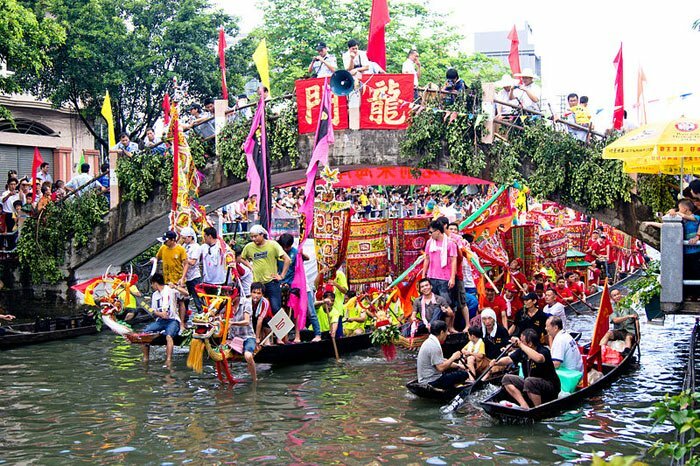 Again, there are many Dragon Boat Festivals in Asia, but this traditional holiday (also known as a ‘Duanwu Festival’) originates in China. It occurs on the fifth day of the fifth month of the traditional lunar calendar, earning it the alternative name of the ‘Double Fifth Festival’. 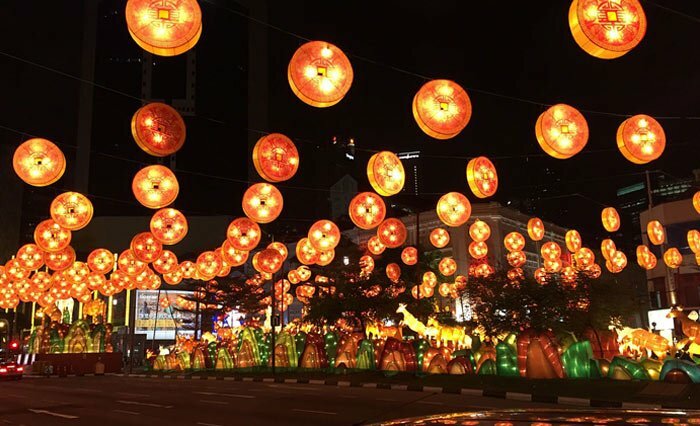 It is also called the ‘Fifth Month Festival’, ‘Fifth Day Festival’ and ‘Dumpling Festival’ in Malaysia, Singapore and by the Taiwanese Hokkien. The traditional celebrations are to prevent disease or evil and promote health and well-being. Activities include preparing and eating zongzi (sticky rice treats wrapped in bamboo leaves) and drinking realgarwine. Celebrators also hang up icons of Zhong Kui (a mythic guardian figure) along with mugwort and calamus, take long walks and wear perfumed medicine bags. The game of making an egg stand at exactly noon on the day gives the successful player luck for the next year. The main event, of course, is the dragon boat race. The human-powered boat made with teak wood is brightly decorated, with the front end shaped like the head of an open-mouthed dragon and the back like a scaly tail. The boats vary in length, size and design and can hold up to 80 rowers. A sacred ceremony is performed before the competition to ‘bring the boat to life’ and the first team to grab a flag at the end is declared the winner. When to go: The event is based around the Chinese lunisolar calendar, so dates vary each year. In 2018, the festival was held on June 18, with June 7 scheduled for 2019. Did you know…? The event is said to commemorate the death of poet and minister Qu Yuan who served in the high offices in the ancient Chinese state of Chu during the Warring States period of the Zhou Dynasty. Qu was banished by the king for opposing his alliance with the powerful state of Qin and turned to poetry during his exile. Qu later committed suicide by drowning himself in the Miluo River in reaction to the capture of Chu capital Ying by Qin powers. Since 1998, the Boryeong Mud Festival has taken place every year in the summer months. Held in the Daecheon beach area in west South Korea, this cultural festival has grown to an excess of 2.2 million visitors since its inception in 1998. 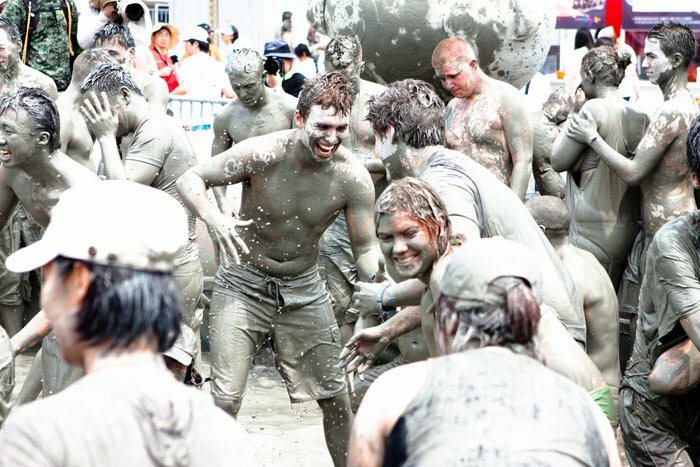 While originally conceived as a marketing vehicle for Boryeong mud cosmetics, the two-week event has become popular Koreans and foreigners alike for its fun-filled, skin-friendly activities. Mud is taken from the mineral-rich Boryeong mud flats every year to use for the ‘Mud Experience Land’ program, along with the many mud-related events, including mud wrestling, mud king contest, mud massage and acupuncture programs, mud sliding, mud skiing, colored mud body painting, swimming in a large pool of mud, a mud spa, and a photo competition, all ending in a spectacular mud fireworks display and dance parties. Visitors can also take part in the adventurous marine-type silt extreme training experience. When to go: The event usually starts mid-July with the final weekend often the most exciting. Dates for 2019 are July 12 to 21. Don’t miss: While in the area, take the time to explore the Chungcheongnam-do province’s other attractions, including Muchango Beach’s “mystic sea road” – a 1500-meter walking trail only accessible for two hours a day at low tide, or nearby Taean Haean National Park for an unspoilt South Korean coastline and delicious seafood. Where to study: South Korea is home to the two of the top 10 institutions in the QS Asia University Rankings, with the Korea Advanced Institute of Science & Technology (KAIST) ranked eighth, while Seoul National University (SNU) is 10th. It boasts a total of 58 institutions in the top 500, including 18 in the top 100. Kuwana City is home to Nabana No Sato, a botanical theme park featuring meticulously landscaped gardens and impressive giant greenhouses. In the spring, the park is colorfully decorated in an array of flowers, blossoms and cherry trees, including row upon row of tulips, pansies, viola, stock and daisies. 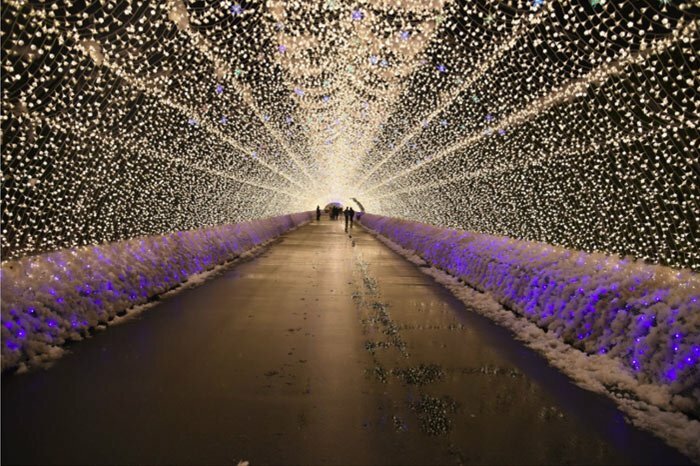 Come winter, however, and visitors to the park can enjoy one of Japan’s most impressive illuminations in the incredible Winter Light Festival. The fragrance of the flowers mingles with the cold winter air as bundled-up visitors arrive in their thousands to enjoy the famous Tunnel of Lights, and the accompanying elegant light shows and designs that blanket the entirety of the theme park and its waters. Created with over seven million LED lights charged using solar panels to reduce the impact on the environment, Japan’s biggest winter illumination includes themed light shows every year – previous shows included ‘Mt Fuji at dawn’ and an aurora. When to go: Open 9am to 9pm, the theme park itself can be enjoyed year-round, but the Winter Festival runs for four months from mid-October to mid-March. Top tip: Wrap up warm in plenty of layers and go on a weeknight if possible as the weekends can get particularly crowded on the weekends. If you want to make a day of it, the park hosts a variety of restaurants including the Nagashima Beer Garden. Where to study: Japan’s top universities hold strong positions in the top 20 of the the QS Asia University Rankings, with the University of Tokyo in 11th place, Kyoto University in 14th, Osaka University in 16th, and Tokyo Institute of Technology in 18th place. Extending our coverage to the Asia-Pacific region is a great excuse to mention one of the most significant events in the Australian cultural festival calendar. The Garma Festival of Traditional Culture is held in Arnhem Land in the Northern Territory, Australia. A celebration of the cultural inheritance of the native Yolngu people, the festival emphasizes the practice, preservation and maintenance of traditional dance (bunggul), storytelling, songs (manikay), art (miny’ tji) and ceremony (Wangga). It’s also a platform for the education and training of indigenous youth. The festival is organized by the not-for-profit Aboriginal Yothu Yindi Foundation and aims to share the knowledge and culture of the Yolngu with non-indigenous Australians in order to foster greater understanding between the two. As such, the festival includes a Key Forum where you can attend talks with indigenous people, a Youth Forum with workshops for indigenous and non-indigenous students, Garma cultural workshops displaying the most unique traditional practices of Yolgnu culture, along with musical performances, a film program, exhibition stalls, the Gapan Gallery and visits to the local community and schools. When to go: The Garma Festival of Traditional Culture is held every August and usually spans four days. Did you know…? The Garma Festival is held in Gulkula, a stringybark forest where the Yolngu ancestor Ganbulabula introduced the yiḏaki (didjeridu or didgeridoo) to the Gumatj people. While the didgeridoo is now a popular instrument throughout Australia, the yiḏaki is specific to the Yolngu people who now use the synonym mandapul to refer to the instrument, out of respect for a deceased Manggalili-clan man whose name sounds similar to yiḏaki. Where to study: Australia has a strong showing in the most recent edition of the QS World University Rankings, with 31 institutions featured and its top-ranked Australian National University in 24th place. This article was originally published in June 2014 by Hasna Haidar. It was updated in October 2018 by Sabrina Collier.